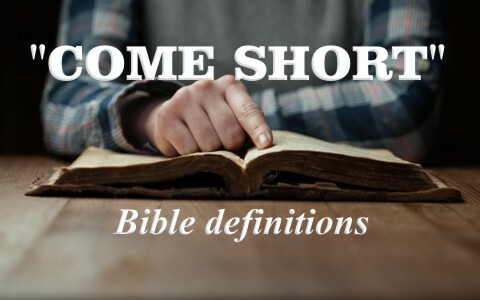 What Does “Come Short” Mean in Romans 3:23? Many Christians are familiar with and use the Romans Road presentation of salvation for sharing the gospel with others. However, there is a particular phrase in Romans 3:23 that is often overlooked or glossed over that is important to fully understand in light of salvation. What does the phrase “come short” mean in Romans 3:23? What is the Roman Road presentation? The Roman Road was created by Dr. Jack Hyles as a simple framework for teaching believers about witnessing to people (1). This framework consisted of verses from the Book of Romans (Romans 3:10; Romans 3:23; Romans 5:8; Romans 6:23; Romans 10:13; Romans 10:9-10). Each verse addresses a certain point and other supporting verses were usually added for clarity. While some debate the presentation of certain points, the Romans Road presentation has been successfully used by countless people to present the gospel, during which many people trusted Christ for salvation. What does Romans 3:23 teach? Romans 3:23 says, “For all have sinned and come short of the glory of God.” There are three phrases of focus in this verse. The first is, “all have sinned,” which describes the reality of humanity as measured by God’s perfect law. Earlier in Romans 3:10 we read, “As it is written, there is none righteous, no, not one.” The concept of sin is described as the breaking of God’s law (1 John 3:4). Therefore, when the Bible says all have sinned, it is saying that all of humanity has broken God’s law. Moving to the end of Romans 3:23, we read, “the glory of God.” What is God’s glory? In this case, the word glory is of God. The word glory used here describes God’s “manifested perfection of His [God’s] character, especially His righteousness…” (2). In light of the previous phrase, all have sinned, this phrase presents the reality of God’s standard of perfection as measured by Himself through the law (1 Peter 5:10-122; 1 John 1; 1 John 3:4-10). Between these two phrases, we see a comparison of man and God. First, we see the imperfect state and position of man as expressed through sin. Second, we see the perfect state and position of God as expressed through the perfect righteousness of Christ. It is the phrase between these two absolute states and positions where we see man’s effort to become like God – we come short. What does it mean to come short? If man’s position and state is not equal to God’s, because of sin, then it is clear that if God is perfect, man is not, hence the saying, “Nobody’s perfect.” If man is not perfect, then he does not measure up to God in perfection. In other words, man “comes short” when it comes to measuring him against God. How then is man measured when it comes to perfection? First, God places great value on perfect measurement. We see this in Deuteronomy 25:13-16 as related to perfect measures being used by merchants. We also see this in Jeremiah 31:37 as related to God’s measure having stability and purpose. We start seeing the measurement of God as related to humanity in Jeremiah 46:28 where we are told that God will correct Israel in measure. What exactly does God use to measure if man has come short? Many of us have heard of a measuring rod. A measuring rod is commonly used to physically measure lengths during the process of surveying land. We see the use of a rod for measurements in Ezekiel 40-42. Likewise, we see a measuring rod used in Revelation 11:1 to measure more than just objects: “And there was given me a reed like unto a rod: and the angel stood, saying, Rise, and measure the temple of God, and the altar, and them that worship therein.” In this case, “them that worship therein” are also measured. Today, many of us have used a rule, commonly referred to as a ruler, to measure things. A rule is the same as a measuring rod. This rod then serves as the standard of measurement. In the case of measuring man, we are told that the Lord will rule man and the nations with a rod of iron (Revelation 2:26-27; Revelation 12:5; Revelation 19:15). Like Israel in Jeremiah 46:28 and the previous verses, this rod of iron will also be used to measure and mete out correction from our Great Shepherd (Psalms 2). What does all this mean in the context of Romans 3:23? If man is being measured, the standard to measure man must have a specific measure that is true. In other words, the measurement must be consistent and without variation. Either the measurement is true or it is not. Therefore, the rod of iron is such that represents the truth and power of God’s Word to break things (Daniel 2:34, 40). The rod of iron used as the truth and power to measure and break are seen in Revelation 19:11-21. When Jesus returns with the believers (church) to rescue Israel, He is referred to as Faithful and True and named the Word of God (Revelation 20:11-13). The Word of God, described as the sharp sword that goes out of His mouth will destroy the nations and rule (measure) them with a rod of iron. Simply stated, the Word of God is the standard of measurement and the rod is used to measure the people using the standard of the Word. Any found to come short of the full measure of Christ (Ephesians 4:11-16) is destroyed. Therefore, to come short of the glory of God means that humanity does not measure up to the standard of God as defined by His Word. Since we fall short of the glory of God, we need a way that we can measure up to the glory of God. That is where Jesus Christ comes in. He was born into this world to live a perfect life that measures up to God’s glory by faith. Yet, God did glorify Him (John 12:23-28; Acts 3:13). Since Jesus did not break the law, He did not have to pay the wages of sin, which are death (Romans 6:23). Yet he allowed Himself to be wrongfully crucified upon the cross to pay four our wages of our sin. In other words, He paid for our imperfections. In doing so, He took upon Himself our imperfection and gave us His perfection or righteousness in exchange for our sin as a gift. Therefore, when it comes to being measured by the Word of God, we no longer will fall short. Instead, God now looks upon the believer as having the full measure of Christ and declares us perfect according to His Word. One day, when we stand before Him, our perfection will be more than just positional in Christ, it will be literal through Christ as we are conformed to His perfect image (Romans 8:29). Romans 3:23 teaches that man is a sinner that comes short of the glory of God. Man has sinned, which demonstrates he is not perfect like God. Therefore, man does not measure up to God’s glory, but instead, comes short of it. However, because of Christ, God now sees the believer as measuring up to the perfection of the fullness of Christ, which delivers us from God’s wrath to come. Resources – Scripture quotations are from The Holy Bible, King James Version. (1) Hyles, Jack (1926-2001). “Jack Hyles’ Favorite Soul Winning Experiences”. The Jack Hyles Home Page, 2017, http://www.jackhyles.com/favoritesoulwin.htm. (2) Vine, W. E., Merrill F. Unger, and William White. Vine’s Complete Expository Dictionary of Old and New Testament Words: With Topical Index. “Glory” Page 267. Nashville: T. Nelson, 1996. Print.